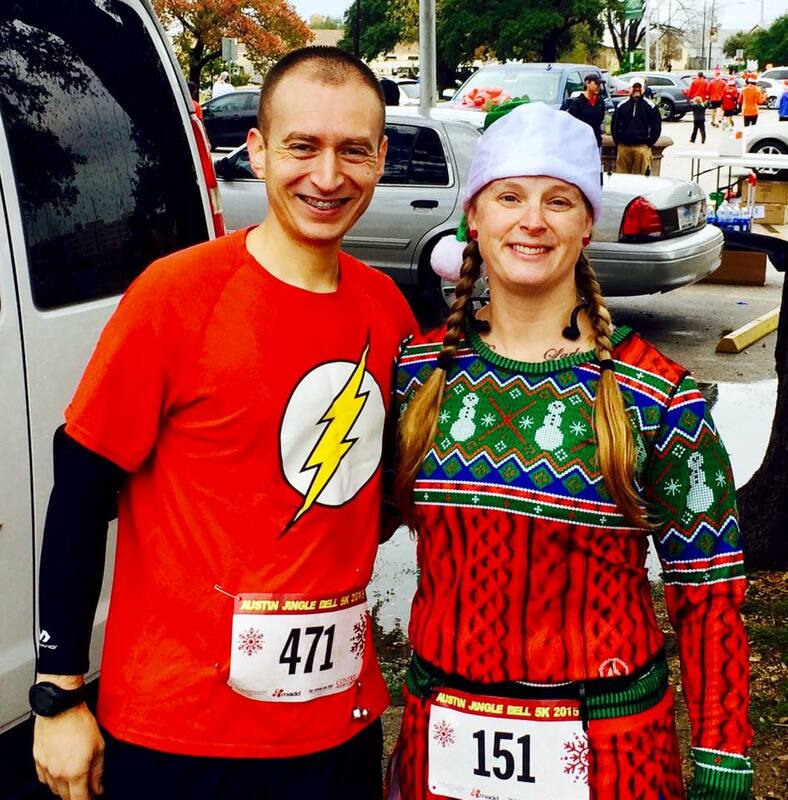 Usually I run the Brown Santa 5K as my Christmas themed run. 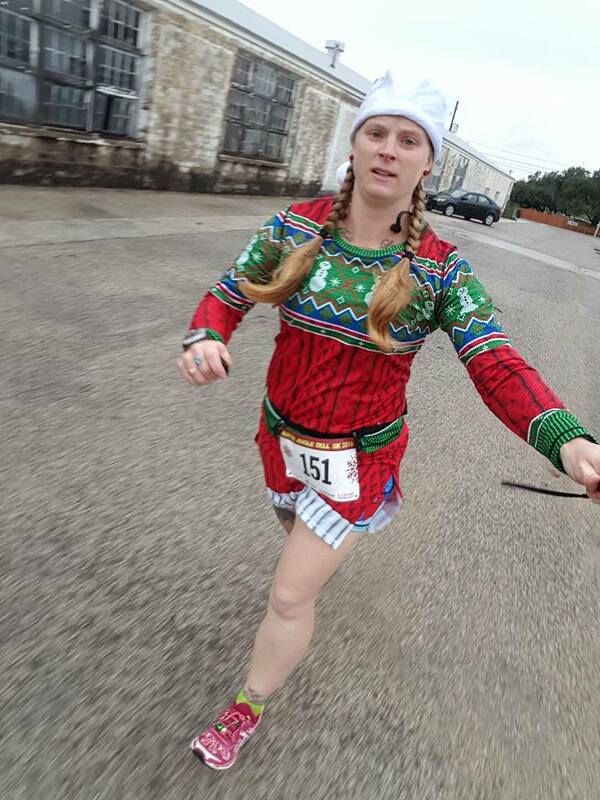 However, I signed up for the San Antonio Rock ‘n’ Roll Marathon and then later found out it was the same day as Brown Santa. However, if I knew that they were on the same day prior to registering for Rock ‘n’ Roll, I still would have signed up for the marathon over the 5K. 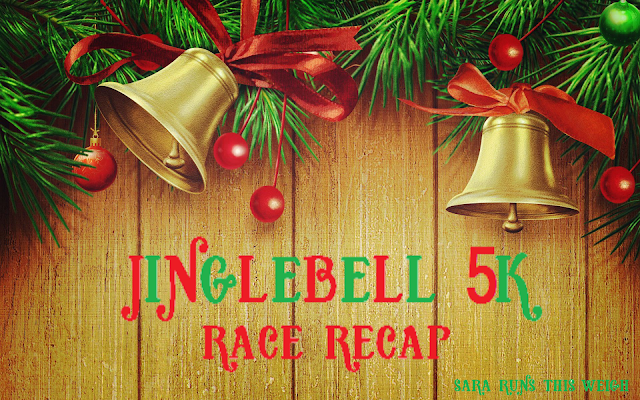 Anyway, as soon as I realized that I couldn’t run Brown Santa, I then started the search for a Christmas themed race that wasn’t on the 5th or 6th of December. Cue the Austin Jinglebell 5K (I have to differentiate because San Marcos has a Jinglebell 5K as well) on December 13th. This was also kind of perfect because it’s only one day before my birthday so I’m sort of celebrating my birthday with a race. Not as epic as running my first marathon on my birthday like I did in 2014, but it’s still fun! Being an INKnBURN brand ambassador, I had bought the ugly sweater and matching sport skirt in the pre-order phase before Halloween! Ever since I bought it, I had planned to wear it to the Jinglebell 5K. As the time drew closer and closer and I noticed that the weather wasn’t very December, I got worried that I was going to be over-warm since the top was long sleeved. As luck would have it, a cool front blew in the evening before the race and I was just fine. In fact, when I wasn’t running I was a little chilled. But, I was perfect during the run. This race was on Camp Mabry. I also run the Autism Speaks 8K, the Freedom 5000 and the Mustache Dache on Camp Mabry throughout the year. One of those races isn’t a 5K, but the other 2 are and they are both the same out and back course. When I picked up my packet, they included a course map. I was a little confused because I was expecting the same out and back course, but was greeted with a looping type course. It was basically the same 2.5 miles that make up the loop that is done twice for the 8K I do there, plus a small out and back to make up the .6 to make it a 5K. I really liked this course, even though it did include a large hill. So many somewhat fast people seemed to be running this race. I was swept along with the crowd and while it didn’t feel super easy like the Mustache Dache did, it wasn’t hard either. The only time I really struggled was on the large hill, but I only lost 8 seconds on my mile time because of it, so it wasn’t THAT bad really. I averaged 9:12 min/mi, snagging my 3rd fastest 5K time of 28:08. Very nice indeed. I didn’t place in my age group, but I’m hoping to be able to snag an age group award at next year’s race. My friend Ben did place. He was 4th overall and 1st in his age group! There wasn’t any photographers out on the course, but there was one at the finish line, so that makes me happy. But I did take my action selfie post-race, anyway. And here’s where I would normally post my official photo, however even though there was a volunteer taking everyone's picture as they crossed the finish line, those photos were never made available. Not even sure what the point of her taking the photos was if they weren't going to make them available.